Get on the Fashion Radar with Wooplr ! Hello lovelies, today let me introduce you to one of new favorite fashion apps Wooplr – that is India’s first fashion discovery app. 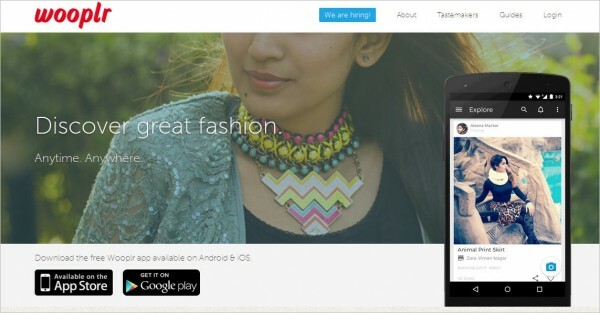 Wooplr is a ‘product discovery’ platform for fashion, food and decor. It helps you discover the latest trends and fashion icons hyper-locally and be inspired. The Wooplr app helps people decide what to buy and where to shop based on their interests, location and social circle. It gives the user a personalized feed of curated fashion products. They curate the freshest and the hottest trends from all across the globe and helps one keep track of all the trends in one place.The app has a fabulous search engine that allows you to type any keywords and look for a specific product. You can also choose the city you are in to make your search more efficient. Check out the curated fashion trends on their site here. Another attraction for users of Wooplr is the chance to follow people they think have a cool sense of fashion. The App lets you follow fashion influencers who upload photos of the latest additions to their closet. As a fashion blogger, it’s important to get your style out there to a wider, fashion conscious audience that extends beyond your personal blog and social media, so when I was asked to come on board Wooplr, as one of the chosen few, I gladly accepted the offer to be a part of the elite style influencers on the App. It helped me share my fashion sensibilities with people and also help them shop similar products based on my look and recommendations. You can follow me as Stephanie Timmins on Wooplr here. Wooplr is available on the web, Android, iOS and Windows Phone. The Wooplr website and the mobile apps are a fantastic visual guide to help one decide what to buy, where to shop and where to eat. You can download the App here . Given the social nature of shopping, Wooplr helps people make decisions related to shopping a lot easier on their phones; wherever they are, whenever they want. Looking for new things to find/buy or visiting a new location – Wooplr brings on the mobile the ease/speed to find things based on your location and current need along with what is trending (being followed the most). What can be more convenient? Say, you are in a particular location and say you would like to buy ‘cobalt fringe shoes with studs’ – Just Woop it ! There is too much on Wooplr to find out on a daily basis. Ideally before a person steps out for either shopping or to eat out, you can check out the Wooplr app first and make your decisions accordingly ! It has on board 14,000 shops and plans to scale that up to 100,000 this year. Last year, it added a location-based feature called ‘Nearby’ to point users to the nearest shops which have what they like. How do we find out about those new products we want but can’t seem to find? Where are the best shops in the city to buy things I like and want? What is most popular dish at a restaurant we are trying out for the first time? We are generally limited to recommendations from our friend circle to figure the ideal places to shop and eat, now we can cast a wider net with this app and follow those experts in their respective fields and be aided by their suggestions. here and don’t forget to follow me here and see my latest fashion recommendations, you can also visit their website here .